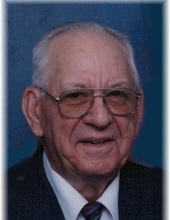 Charles Moses, age 93, of Burlington Junction, Missouri entered into peace Wednesday, January 30, 2019 at Nodaway Nursing Home, Maryville, Missouri. Funeral Celebration of Life Services will be held 2:00 PM Saturday, February 2, 2019 at the Christian Church in Burlington Junction, Missouri. Visitation will be held Saturday at the church following the interment with fellowship and a luncheon with the family greeting friends. Interment will be held at the Ohio Cemetery in Burlington Junction, Missouri with military rites provided by American Legion Rolla Dicks Post 315.. Memorials may be directed to Burlington Junction Christian Church. Memories and condolences may be shared with the family on our website at, www.ritchiefuneralhome.com under Obituaries. Arrangements were entrusted to the Ritchie Funeral Home of Clarinda, Iowa, where we ‘Celebrate Life’. Charles Robert Moses was born August 24, 1925 in Elmo, Missouri at the home of his parents, Robert Leroy Moses and Louise Jane (Calfee) Moses. He grew up in Elmo and attended High Prairie Country School. On March 25, 1944, Charles was united in marriage to Marjorie Lee Shipley at Washington Methodist Church, Kansas City, Kansas. Early in his working career, Charles worked for area farmers. He was hired by the Missouri Department of Transportation and in 1951; he entered the United States Army serving until 1952 during the Korean Conflict. Following his discharge, he returned to the Highway Department working for 37 years. Charles and Marjorie lived all of their married life in Burlington Junction. Charles was a member of the Elmo Christian Church where he attended until his health prevented it. He was a member of the Rolla Dicks American Legion for sixty five years. Before his health declined, Charles enjoyed being outside hunting, gardening and mowing the yard. He enjoyed socializing and making people laugh. Charles was well known for his sense of humor and never met a stranger. Preceding Charles in death are his parents, Roy and Louise Moses; wife, Marjorie Shipley Moses. Left to cherish his memory are his many nieces, nephews and cousins. A luncheon and visitation will follow the interment. "Email Address" would like to share the life celebration of Charles Robert Moses. Click on the "link" to go to share a favorite memory or leave a condolence message for the family.